In Gotham this week, Bullock and Gordon argue over why he didn’t kill Penguin whilst the latter runs to his home to find two of Fish’s henchmen waiting for him with Barbara. Fish is panicking to what Penguin might reveal to Falcone of her plans to take over as crime boss. The whole of GCPD is against Gordon and when psycho killer Victor Zsasz walks in to ask where Gordon is, they not only point to his location but walk out when asked by him, including the captain. Gordon is shot in the ensuing gunfight and runs for his life but is saved just in the nick of time by Montoya and Allan. Szasz shoots an innocent police woman and cuts his arm in a tally of kills to twenty-eight so far. Fish goes to Maroni to ask for Penguin who refuses to give him up. Not long after a consignment of Maroni’s guns are stolen by Fish’s henchmen which enrages Maroni. Instead of giving up Penguin, he decides to fight for him for he believes he is a goldmine of information. Gordon goes to Bruce to tell him all that’s happened and that he may not survive to find his parents killer. Penguin leads Maroni’s men to a kill and seemingly is about to come to a sticky end when he turns the tables, always one step ahead of the game with his quick mind and survival instinct. A meeting is arranged between Falcone and Maroni with Fish seething in the background whilst elsewhere Gordon is preparing for war. Bullock turns up and says he is ready to help him with whatever Gordon wants to do to set things straight by arresting the mayor first. They next turn up at Falcone’s house to arrest him and Gordon tells him Szasz has Barbara and will kill her if he doesn’t surrender. Falcone threatens to kill them all but let’s them go. 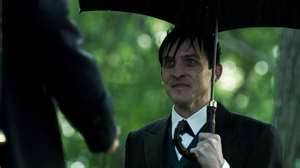 In a flashback Falcone remembers how he met Penguin and what led to the situation they all find themselves in now, all planned and arranged by them both, playing Maroni and Fish without their knowledge. This story showed Cobblepot at the height of his powers and how he has played them all in his quest for ultimate power. There are so many strands here that it is not until the end that you see how it all came to be up until that point. Written and directed by two of Britain’s best, this episode has shown how complex this series is and how it will be in the future. All the characters now are vying to eat the screen alive with the scripts they are being given and you can easily see they are having the time of their lives. There is so much more to tell and yet I feel that they may be rushing their way through it all whilst Bruce Wayne still has many years yet before he dons the cowl and cape to fight the corruption of Gotham. I am sure though that they have it all figured out to stretch to five seasons and beyond if it is still successful. Who knows, maybe there will be a Batman spin-off after but I get ahead of myself. For now, I shall enjoy this amazing modern Gothic work and be lost in its brilliant storytelling. Ben McKenzie as James Gordon. Carol Kane as Gertrud Kapelput, the over-possessive, mother of Oswald Cobblepot.